Join us for our Taize Ecumenical Prayer Service this Monday, April 14, 8:15-9pm in the Church. Our sixth grade class of Holy Cross Academy will perform “The Tale of Three Trees”, in the Church this Wednesday at 7pm. Please join us for this very beautiful and moving musical presentation. Please plan to join us during the Easter Triduum for our very beautiful liturgies and walk with Our Lord on Holy Thursday, Good Friday and Holy Saturday. 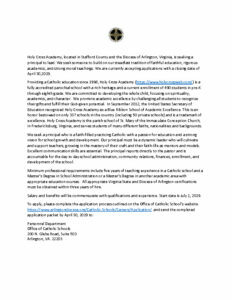 A complete schedule for Holy Week and Easter can be found on page 7. 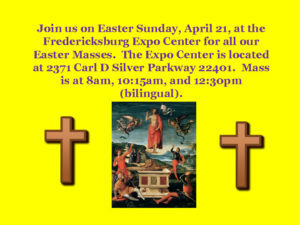 All Masses on Easter Sunday will be held at the Fredericksburg Expo Center. Masses are at 8am, 10:15am and 12:30pm. There is plenty of parking. No Easter Sunday Masses will take place at the Church.